Saint Dominique of France – according to a song – went about simply, living in financial poverty and singing. In every town and along every road, he spoke only of the good Lord. One of the French stanzas tells how this servant of God met “a heretic” one day but converted the man by his joy! I love that. What a powerful account in a few lines of poetry. You can find an English translation of the song here. I’m already humbled. I’m already inspired. Are you? But, what has this missionary mini-biography to do with Blue Ridge Mountains Christian Writers Conference, which I attended as a first-timer May 22-26? He talks only of the good Lord. He just talks about the Lord. He speaks only about God. Fiction, yes. Christian – why? 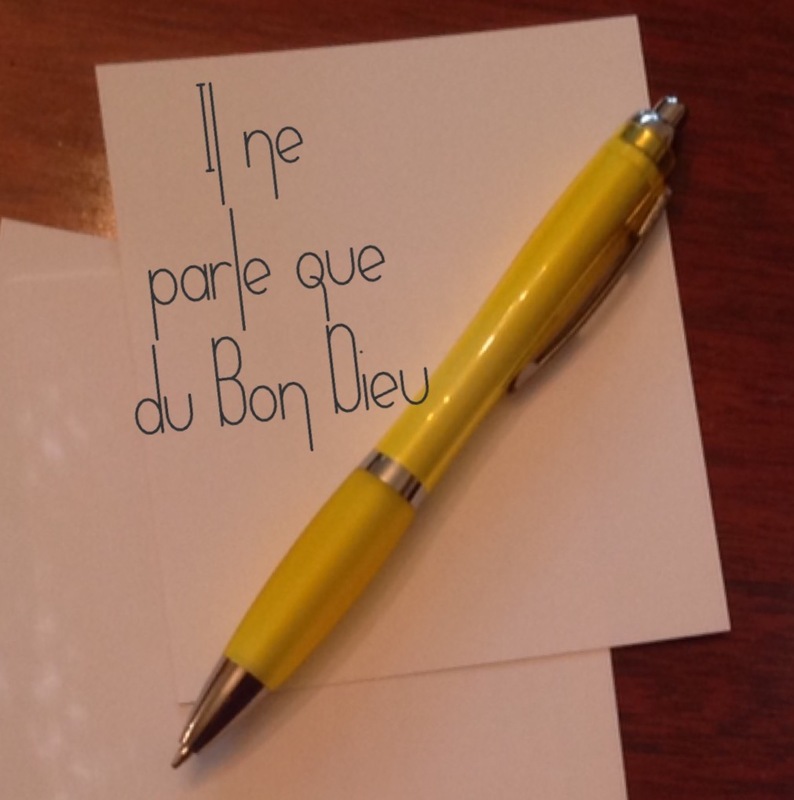 As I sang along with that French line repeatedly in my Ford Explorer on Thursday, thanking God for the experience at Ridgecrest and for safety over so many miles of highway, “il ne parle que du Bon Dieu” told the whole reason I went to the conference at all. I’m trying my hand at authoring novels now. I need to learn how one builds characters, constructs plot, and chooses point of view – and how one attempts to find a publisher. Now, there is a very valid argument for Christian people writing “secular” books and songs and using that opportunity to connect with fans from all walks of life, rather than pigeonholing themselves with content that specifically exalts Jesus Christ and expressly promotes a life lived in the Holy Spirit and strengthened by unrelenting reliance on Scripture. That approach was suggested to me by one publisher at this conference after he heard me say “mystery” and as he conversed with me about genre and about my goals. Elle ne parle que du Bon Dieu. If ever a writer deserved that description, it is Grace Livingston Hill. If Betsy Lowery ever gets a novel in print, that book will parle du Bon Dieu. Please share my blog address with a friend and stay tuned for more in the continuing saga of my attempt to get published in the world of Christian fiction. Today’s story is about my short-term goals not “jiving” with somebody else’s request for my time. On Friday I made one of my many lists. This one was called “10 goals in 8 days.” With just eight days before I would head to North Carolina for my first Christian writers’ conference, I had a lot to accomplish. Needing to learn a great deal about what it takes to write good fiction, I’ve been preparing for this five-day training opportunity for months – on every front from wardrobe to possible side trips to color handouts about my myself and my two unpublished novels. In fact, a whopping six of the 10 goals I listed were conference preparation. Two others were about knitting. (No surprise there.) And the final two were about personal appearance and fitness – neither of which would have been on a list just then if not for the conference. As luck would have it, the first three of my ambitious eight days were the same days our young adult daughter was going to the beach. Jeff and I had offered to keep her new puppy, Crosby, before I had made my to-do list. Let’s face facts. No matter how much you fancy yourself a successful multitasker, you just aren’t going to finish a knitted washcloth that’s an overdue thank-you gift for a neighbor who helped during your last plumbing crisis while getting puppy’s leash out from under his front leg six times during each of his “bathroom” walks. You’re not going to cut 1,000 words out of your too-long chapter 10 if your brand-new granddog (who is the #cutestthingever) wants you to play tug of war with his ratty, blue rope toy. No chance of revisiting the scope of chapter 11 and texting grandma/granddog selfies at the same time. Sure, if I could have picked a different weekend to puppy-sit, I might have. But this was something my child needed of me, and that was more important than being frustrated over a self-imposed agenda that, if prevented by some other important opportunity, or by a crisis such as an emergency-room visit, wouldn’t have caused my world to stop turning. Futhermore, now in the lower numbers the of “senior adult” age bracket, I have learned to take unplanned detours and interruptions a little more in stride, a little more with patience and wisdom, than I used to. Facing interruptions with patience is a great virtue. There is love to share in those moments. There is service to give and something to learn – something that will benefit you down the road; trust me. If neither parenting nor anything else has taught me this, my past and present jobs in a church office have: people can tell when you are impatient with their interruptions, when you aren’t really listening and want nothing more than for them to finish their business as quickly as possible so you can get back to what you were doing. Perfect opportunity to throw in one of the John Maxwell leadership principles I have internalized: customers and coworkers are not an interruption of your work. They are your work. I would fall somewhere in the middle on that debate. Most people know it’s impossible to “plan” one’s whole life; too many unexpected things happen for that to be a realistic goal. But, sure, you can plan a day or a week or a weekend. Or you can try to. But, should you? Every day, week, and weekend? All the time? As a life’s pattern? No possibility of spontaneity? No getting sidetracked? No patience with interruptions? Have I mentioned that our puppy-sitting gig turned out to get one of my “tabled” goals accomplished? It was number seven on the list: “get a handle on next blog post.” I had absolutely no idea puppy-sitting would provide the material for a new post – and I now rest my case on the value of tolerating interruptions.